DALLAS, Nov 28, 2011/ FW/ — Taking center stage in Vancouver, BC during the 2010 Winter Olympics, figure skater Yuna Kim became an international superstar when she won the Olympic gold. To many, Yuna Kim is just another athlete on top of her game; but in her native South Korea is a teenage heartthrob, a role model even a fashion icon. 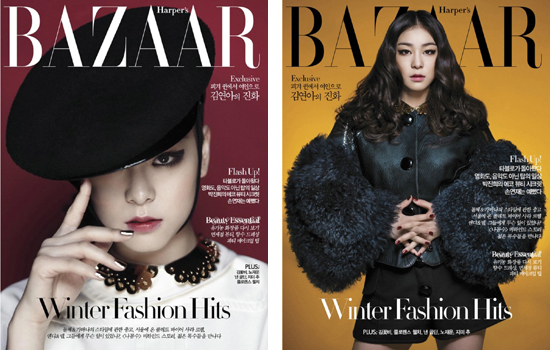 Hence, it’s not surprising that she is featured in the cover of the December 2011 issue of Harper’s Bazaar Korea. And what a cover!!! Wearing Louis Vuitton clothing and accessories which was completed with Minx nails as a finishing touch, the athlete Yuna Kim was upstaged by the alluring Yuna Kim. Shot in Korea in early November, Yuna Kim who turned 21 this year shed her ingénue image and was replaced by a sophisticated mature woman. With red lighting and green background, the holiday mood was easily achieved.